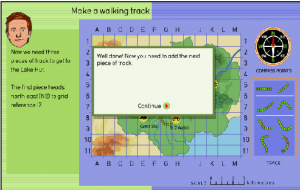 In the previous lesson ‘Introducing Mapping Skills’ students were introduced to using a grid reference to locate places and position on a map. In this lesson students learn about different scales used on maps as well as position using a compass. This lesson was designed for a year 3/4 composite class, has been tested and worked well; the students loved the interactive rainforest map and finding the ‘hidden treasure’ on their friends maps. However, it might take 2-3 lessons (depending on the length of time you have for each lesson) to complete. Explain that last lesson we looked at grid references which is one aspect used to locate place and position on a map. Inform students that today they will be looking at scale and direction. 1cm = 1km (this means that every cm on the map is equal to the actual distance of 1km in the real world). Graphic scale (like on the map we will be looking at ). As a ratio, e.g. 1:100 (use the same unit, e.g. cm). Discuss the importance of scale and people who use scale, e.g. architects, landscapers, gardeners, builders, people in general to find out the actual distance travelled. Discuss direction using a drawn compass on the white board with North, East, South, West, North East, South East, South West and North West labeled. Provide students with a compass to look at if possible. Tell students about the mnemonic ‘Never Eat Soggy Weet-bix’ to help them remember where North, East, South and West are located on a compass and explain how knowing these directions also helps us to locate places and position on a map. Students create the walking track using their knowledge of direction. Each time it asks for a direction all students point towards that direction. After students have created the walking track point out the scale on the map and ask them how they can measure the distance of the walking track using the scale when the track is not straight. Ask can we use a ruler to measure it? What else could we use to measure it? Using a piece of string measure out the distance of the walking track using the scale on the map to find the actual distance of the walking track. In small groups, students observe other maps such as those from their local area to locate places using their knowledge of grid reference, scale and direction. Students create their own grid map of the classroom or playground using a grid reference, scale and direction. Students select a square on their map where there will be ‘hidden treasure.’ They will also draw an X in one of the squares on their map as a starting point. They are to write instructions using grid reference, scale and direction to guide a friend from the X (starting point) to the ‘hidden treasure.’ Their friend follows the instructions and states the grid coordinate to see if they have successfully located the ‘hidden treasure’. 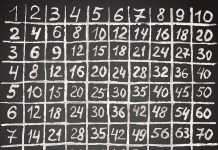 Remind students of the importance of placing items in a single row and column so they can be easily located. Checklist recording students understanding of grid reference, scale and direction.